For lots of people, this was the story of the week — if you saw it covered anywhere. Say what? If you were following any moral and religious conservatives on Twitter late this week, then you saw the explosion of outrage about proposed Virginia legislation that cranked up the flames under a topic that has long caused pain and fierce debate among Democrats — third-trimester abortion. However, if you tend to follow mainstream media accounts on Twitter, or liberal evangelicals, or progressives linked to other religious traditions, then you heard — not so much. Ditto for big-TV news. After all, the direct quotes from Gov. Ralph Northam of Virginia were pretty out there, if you read them the same way as the leader of Democrats For Life, Kristen Day, who put the i-word in play — infanticide. What’s the fight about? On one side are those who see Northam & Co. opening a door that leads — with a wink and a nod — to horrors that are hard to contemplate. On the other side are those who see the right to abortion under attack and want to protect every inch of the legal terrain they have held for years, and perhaps even capture new ground. On the pro-abortion-rights left, what happened in Virginia — what Northam and others advocated — is not news. The news is the right-wing reaction — it’s the “seized” meme — to those words. And, of course, the tweeter in chief piled on. Want to guess which wide the Acela-zone press backed? Yes, that Post headline was not on the main story linked to this topic. Now, what about Northam’s words? 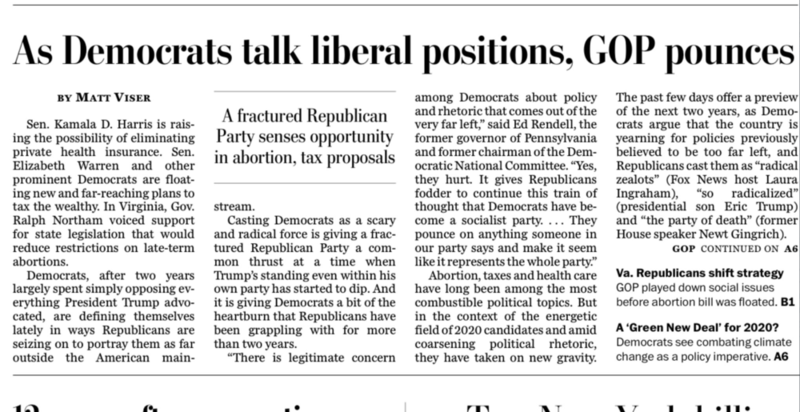 The Post lede mildly stated that he “voiced support for state legislation that would reduce restrictions on late-term abortions.” That’s one way to put it. I feel a strong urge to end this sad post with something positive. Newer PostPodcast thinking about our future: Does anyone still believe in old-school, 'objective' journalism?